If you need a 2001 Mustang Hood there's no need for a fiberglass copy, when you can get a brand new steel hood for so little money. This well made 2001 Ford Mustang hood is a great replacement for your original stock unit. This is a nice reproduction of the 1999 to 2001 SVT Cobra unit, and is available with an optional hood scoop. It's primed and ready for your favorite color and is a direct OEM replacement part. That means it's designed to bolt right on to your existing hinges and accept all the factory hardware. This 2001 Mustang replacement hood comes with a 1 year, unlimited mileage warranty. With a price that's less than the cost of most fiberglass replacements, it's hard not to like this Ford Mustang hood. 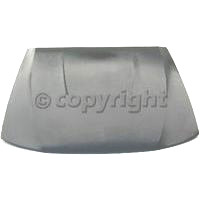 Click the link for more information on this all steel 2001 Ford Mustang Hood. Still looking? Use the search box to find more information.